Alicia Alonso is one of the most outstanding personalities in the history of dance and the top figure in ballet in Latin America. She is a symbol of genius and perseverance. On the occasion of her 90th birthday, the Ministry of Culture in Cuba has announced a national tribute to be held in December, 2010. As other institutions and groups of dance around the world join the celebration, so too will The Canadian Ballet Youth Ensemble (CBYE) with the City of Hamilton. In 2007, after an absence of 37 years from Canadian ballet stages, the CBYE was able to accomplish the extraordinary cultural coup of bringing to Hamilton the National Ballet of Cuba and its legendary artistic director, Prima Ballerina Assoluta Alicia Alonso, as guests and partners of the CBYE. The entire City of Hamilton welcomed Alicia and the artists with open arms, with respect, and with admiration. The full-house performances of The Nutcracker attracted to Hamilton ballet aficionados from distant parts of Canada, the United States and beyond. Hailed by ballet experts and critics from all over the world as one of the five best ballet companies of modern times, Hamilton received both international and national acclaim as an emerging arts community. The cultural exchange between Hamilton and Cuba continues to flourish today. 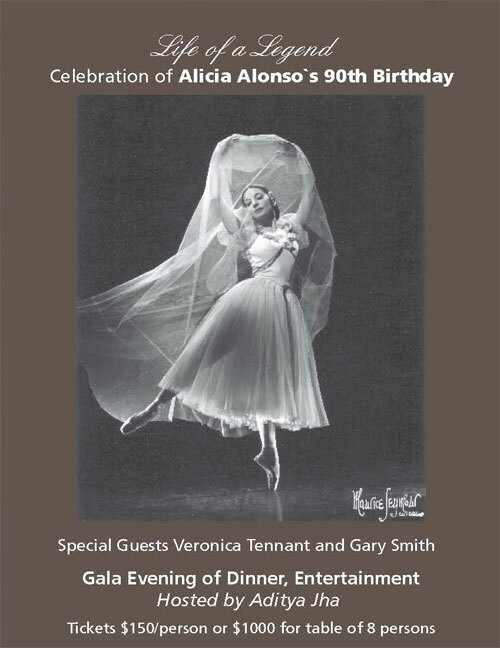 Please join us on December 6th to honor Alicia as one of the greatest dance legends of all time. As director and leading figure in the National Ballet of Cuba, Alicia continues to be an inspiration and a role model for all who have come to know her. The gala will be a tribute of respect and admiration for the great contribution of Alicia Alonso to the world of dance. For tickets please contact CBYE at 905-512-1453 or by email info@cbye.ca by November 25th.